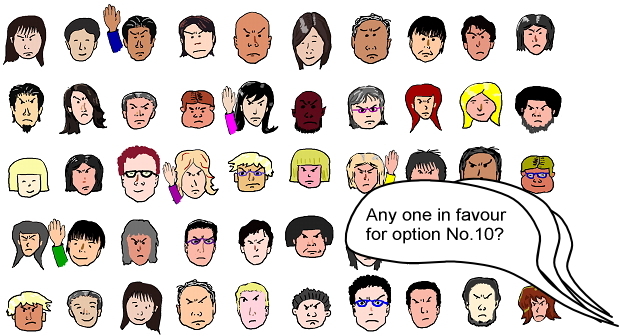 Because 50 choices have been reduced to only ten, many people look unhappy. But there is no way other than that for the majority to make a decision. So they are unwillingly choosing one among the options, which many of them really do not like. Many people look unhappy now. But never mind! Let's try again! …There are still 10 options to choose from. Let's choose one by majority rule. Oh, Each option has got only about 1/10 of vote. No option has got majority. This means we cannot come to the conclusion.